Installing applications purchased under Volume Purchase Program (VPP) is no different than publishing normal iTunes applications. However there is some additional information related to Licenses that will be displayed so as to help you see if there are enough licenses available. This document is the second of a two-part VPP help guide, and here we focus on how to install VPP applications and view the license information. Create an Apple Device Profile and Enroll an iOS device. Navigate to Enterprise > My Apps > APPLE APP STORE tab. Click on any application that you want to install. 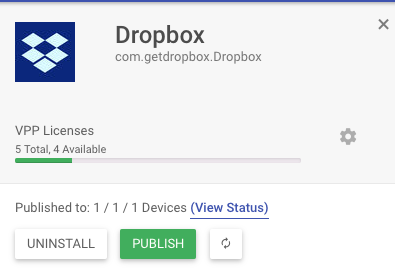 For example let us click on Dropbox application. You would see the app-info dialog appear from right as shown below. View VPP Licenses information - The top section shows you the information about the VPP licenses that is how many total licenses are there and how many are available. PUBLISH - Use this option to Install the application to your Apple Device Profiles. If the number of devices are more than the number of licenses available then the application will not be published. You would have to procure more licenses and then publish the application. UNINSTALL - Use this option to Uninstall the application from your Apple Device Profiles. Question: Can I install an VPP application to only one device in the Apple Device Profile? Answer: No. At this point of time we don't support installing to only one device. You have to publish the application to a Device Profile. Question: We enrolled a new device into MobiLock, but the VPP application is not getting installed? Answer: Please make sure that you have sufficient licenses for the VPP application that is not getting installed. If you need more licenses then please Purchase more licenses and then publish/install the application again from Enterprise > My Apps > APPLE APP STORE tab. Question: How do I remove License from one particular device? Answer: At this point it is not possible to Uninstall or Reclaim license only from one device. You would have to do it at a Device Profile level. So if you have one or more devices where you want to reclaim the license, then you can either remove this device from the profile or please create a new Apple Device Profile without the said application and then move all the devices to this new profile. This would make sure that the license is reclaimed. ﻿﻿Head over to our Application Configuration guide to learn how to configure iOS applications from Dashboard.